God hears our prayers, and he often chooses to use us to answer the prayers of others — even on the opposite side of the world! 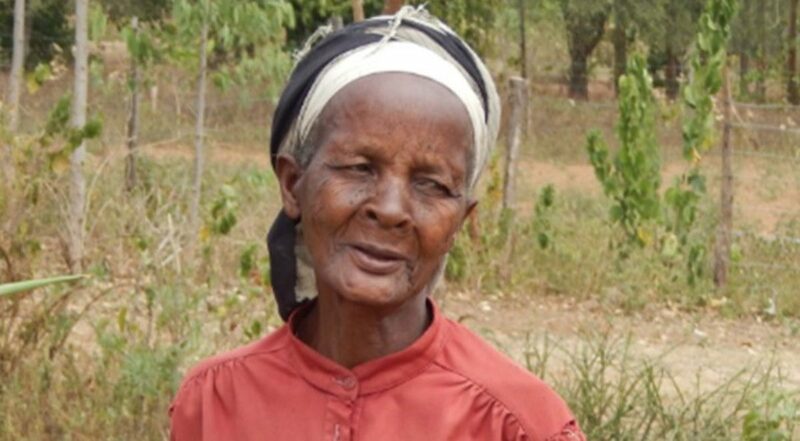 For 15 years, 85-year-old Dani Fileria waited through drought, sickness, and thirst, praying that God would one day bring safe water to her community. Finally, after years of waiting, Dani’s community of Ngulu, Kenya, is receiving safe water. Implemented by Water Mission Kenya, this long-awaited water project will transform the lives of Ngulu’s 3,600 residents. Ngulu is located in western Kenya, where the dry season is significantly longer than the rainy season. During these annual droughts, the need for safe water is all the more evident. The safe water project was commissioned last April and is currently in the final followup stage. During a recent follow-up visit, Water Mission staff met Dani at one of the community taps. She greeted them and asked if they were the God-sent people who gave her rest by providing water at her doorstep. Before the implementation of the water project, residents would collect water from a stream three kilometers away. “I came to celebrate what I thought I would go to the grave without my eyes beholding. I praised God with all the languages and ways I knew. He had not only answered my prayer but had given me more than I asked — water flowing from the tap at an affordable cost within my own community,” Dani said after the celebration of the arrival of water in her community. We are so thankful for your support that makes stories like this possible. May God be praised for his overwhelming faithfulness. Water Mission is an NALC Recognized Ministry. You may learn more about their work at watermission.org.